Bricks 2019 is back ! This is your chance to vote for the best property or construction company in the region – whether you are a client, employee, manager, or director – or just feel a company deserves recognition for a particular project, this is your chance to put them forward. Just drop us a line with why you’ve chosen to vote for them and leave the rest to us. Voting is quick and easy and we will take into account the number of votes in relation to the size of a company’s workforce and turnover to make sure everyone has an equal chance. Organised by East Midlands Business Link Magazine, the Bricks Awards is a high profile property and construction event that aims to recognise development projects and people in commercial and public building across the region: from offices, industrial and residential, through to community projects such as leisure schemes and schools. The East Midlands Bricks awards is also a chance to network with the region’s property and construction professionals at a glittering awards ceremony on the 28th of March 2019, at the Trent Bridge Cricket Ground. A limited number of tickets are now available for this highly anticipated event which aims to celebrate the achievements and outstanding work of those behind the changing landscape of our region. 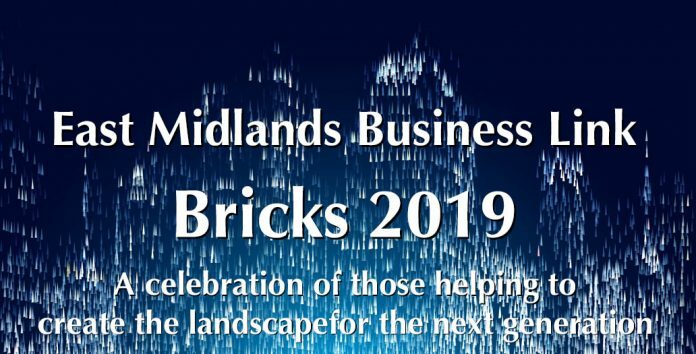 The Overall Winner of the East Midlands Bricks Awards 2019 will also be awarded a year of marketing/publicity worth over £20,000. Complimentary drinks and canapes will be served at the event on arrival. Dress code is standard business attire, and there will be plenty of time for networking. 7.30pm – End of Formal Proceedings, guests and nominees are invited to stay and celebrate/network over drinks. Book your place at the awards now to avoid disappointment!